If you don’t believe the adage “If it’s free, you’re the product” then you need to go and look at the BBC’s foot-stomping and whining at Google. I’d hoped that the BBC would be above this kind of behaviour but it’s becoming clear that it’s just another commercial media organisation, albeit a state-supported one. Sad to see the day. The rapid advance of technology might seem to be the defining feature of today’s world but tech is only one piece of a complex puzzle. 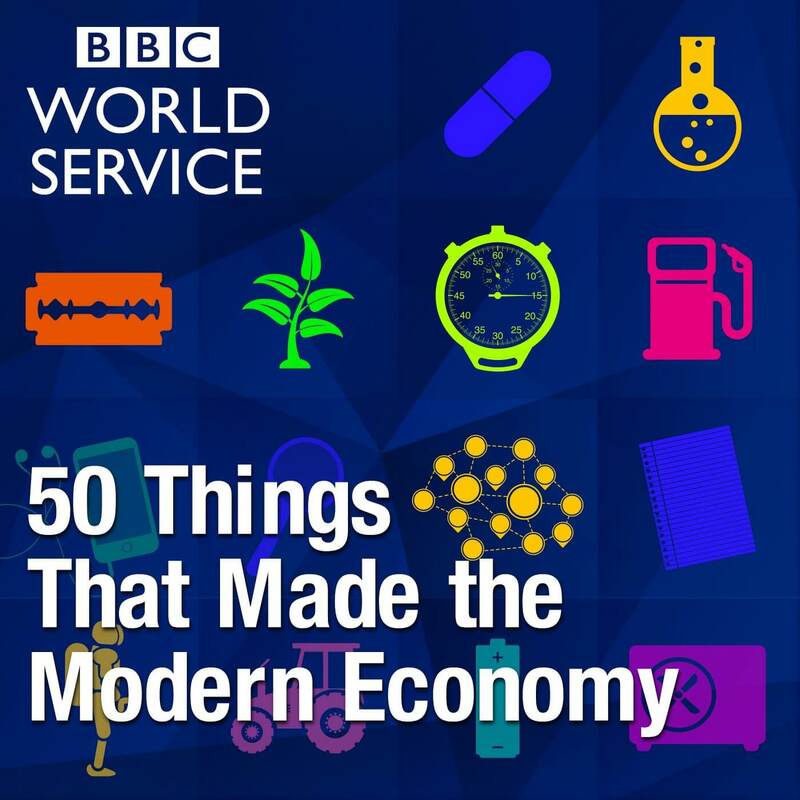 From lightbulbs to TV dinners, shipping containers and public key cryptography, the BBC World Service reveals Fifty Things That Made The Modern Economy. The programmes are a little under 10 minutes long and examine an eclectic range of inventions, ideas and philosophies that underpin much of which is familiar to us. Some are obvious, such as the smartphone and iPhone in particular. Others less so, such as the Haber-Bosch process. The supporting evidence for each thing is provided via a reading list for every episode on the website. There’s no fake news here, Mr Trump. 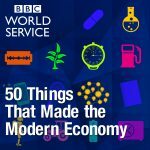 The series is a little over halfway through (episode 30 is the latest) and all the past programmes are available for listening on demand from the BBC. For true hipsters, it’s on the Wireless – times vary with location. Add it to your playlist for something a little less ephemeral and a little more enduring. My love of audio extends back to childhood, listening to late night radio shows under the covers while the rest of the house slept. Living not far from France, I’d pick up foreign channels, their exotic chatter filling the airwaves. For me, podcasts represent the current evolutionary peak, the ability to listen to whatever I want, from wherever in the world, whenever I want. Aside from the lack of hours in the day, I’ve always been frustrated by the lack of curation with podcasts as it’s actually quite hard to find really good podcasts. Many are all too similar, many are too ephemeral and many are too full of themselves. I want podcasts to inform me, to disturb me, to challenge me, to tell me that I’m not alone. So I have high hopes for the BBC’s new podcast series, In Pod We Trust, in which “Miranda Sawyer presents a round-up of the best spoken word audio podcasting from around the world.” There’s only been one episode so far and it’s looking promising, with an excerpt from a podcast where a father discusses a very personal event with his son in a candid and revealing way. Mainstream media would never have got the story, never mind broadcast it. I’m looking forward to the next download already. Business intelligence company Experian Hitwise recently released the top 10 searched for brands in the UK. Top of the pile came internet giants Facebook, YouTube and eBay with four British brands showing; catalogue store Argos, fashion shop Next, news and media organisation the BBC and tabloid newspaper the Daily Mail. Here’s the full top 10. According to Hitwise, around 2% of all searches in the UK were for “facebook”, and variants such as “facebook login” and “fb” made three of the top 10 searches overall. While it’s not 100% clear from the press release how the data was gathered and what search engines were involved, the research suggests that lots of people use search engines in preference to the address bar, even when the web page is simply the brand plus .com or .co.uk. You can begin to see why there is so much money to be made from advertising in search: every time one of these people goes to a web site, they’re using Google, Bing or Yahoo to get there. Frankly, the one that really amazes me is “google” at #7. People are using search to find a search engine? This doesn’t make sense and my only thought is that large numbers of people don’t know that it’s possible to reset their default search engine (or home page). Consequently, they’re using Bing to find Google instead of changing the settings in their web browser. Amazing. If anyone has any alternative thoughts, let me know in the comments. 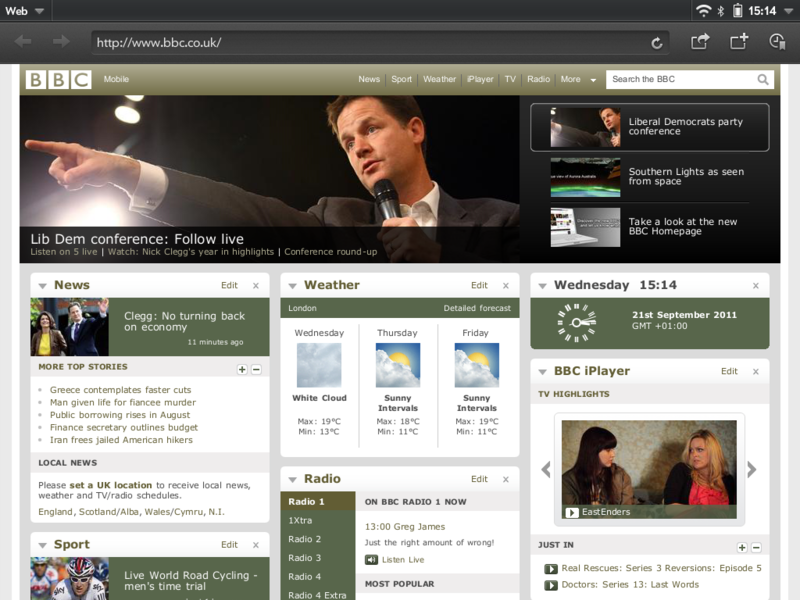 The BBC is embracing the post-PC world with a reworked homepage at beta.bbc.co.uk. Here’s what it looks like on my TouchPad. The black arrows on either side slide the screen through three other views. It’s a little bit reminiscent of how the BBC’s iPlayer displays programmes on my Bluray player, which isn’t entirely unsurprising. Some of the other features, such as setting your location, aren’t yet working but will be fixed before this version becomes the standard interface. Compare this with the current mobile version of the site and you’ll see the change. 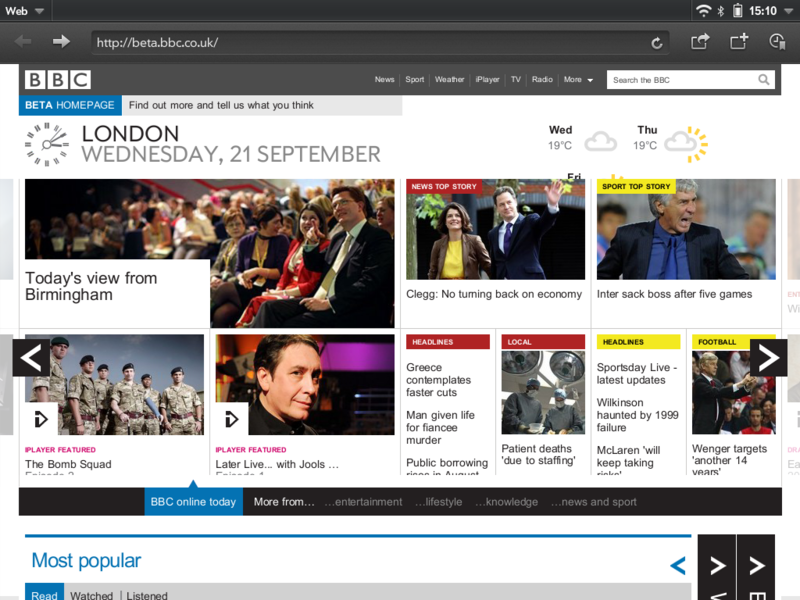 The BBC’s homepage was probably due for a refresh anyway, but I think it’s fairly telling that the new page is going to look the way it does. One can only assume that the BBC has stats on the web browsers being used to visit their site and they show the trend towards tablets and mobile devices. Is this the post-PC era with touch now driving the user interface, rather than keyboard and mouse? This year’s BBC Reith lectures came to a close today with the last of three lectures on Securing Freedom, presented by Eliza Manningham-Buller. The name may mean nothing to you but she was the Director-General of Britain’s Security Service, aka MI5, between October 2002 and April 2007, and she reflects on 9/11, the wars in the Middle East and how the world has changed in the last ten years. The three lectures are titled, “Terror“, “Security” and “Freedom” and a give a British perspective on the role of the intelligence services and the relationship with the US during a period both countries were under attack. If you are a seasoned spook-watcher, there’s probably not that much new, but I personally found it revealing and reassuring that the British Security Service is more measured and ethically-minded than the media would have us believe. Baroness Manningham-Buller doesn’t shy away from controversy either, steadfastly refusing to accept torture as an intelligence tool, and suggesting that the US’ use of waterboarding was a “profound mistake”. You’ll have to listen to the podcasts to understand her reasoning. The lectures are available as podcasts and also as transcripts for those who would prefer to read. Sixty years of the BBC’s Reith Lectures archive have been made available as downloadable .mp3s, a fantastic resource for Renaissance geeks and lovers of 20th century history. 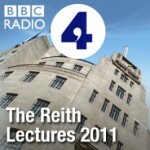 The Reith Lectures are an annual short series of lectures on issues of the day pitched to the general public and given by respected individuals. They cover a wide range of topics but are touched by the era in which they were recorded. There’s usually four or five lectures in a series. They’re named after Lord Reith, the first Director General of the BBC and started in 1948, continuing to this day. This year’s lectures on “Securing Freedom” will be given by Aung San Suu Kyi, Burmese pro-democracy leader and Baroness Manningham-Buller, Director General of MI5 from 2002 to 2007. Last year’s were on “Scientific Horizons” and were presented by Martin Rees, President of the Royal Society. As you can see, these aren’t irrelevant boring lectures by dull academics. Until now, if you didn’t catch the lectures when they were broadcast through the RSS feed, you had to use iPlayer to listen to the lectures and the on-line archive has been expanded right back to the start in 1948. Currently, they appear as three tranches, 1948-1975, 1976-2010 and this year’s, 2011. Hopefully, the downloads aren’t restricted to the UK as there’s some very interesting content that’s worth listening to, some still relevant to today and other material that will help you in understanding previous decades and the impact they’ve had on today.